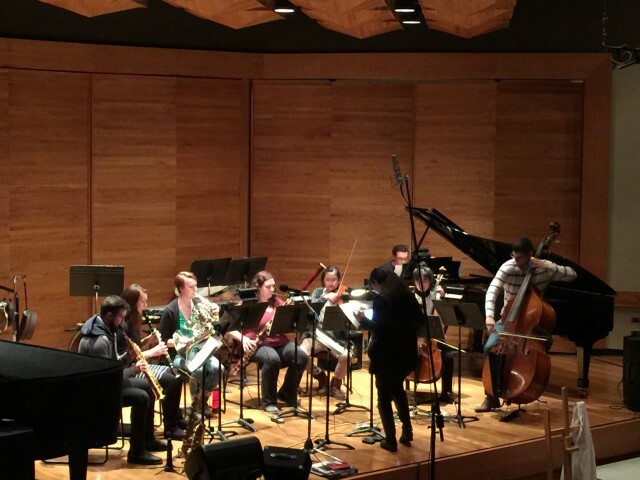 The Brandon University New Music Ensemble is preparing to host the New Music Festival, Thursday, Jan. 21 and Friday, Jan. 22 in the Lorne Watson Recital Hall. BRANDON, Man. – The New Music Festival returns to Brandon University (BU) this week with Manitoba: Edge. This year’s edition of the annual pro series event will focus on Manitoba composers. Festival director Megumi Masaki and the Brandon University New Music Ensemble (BUNME) will stage two free concerts, on Thursday, Jan. 21 and Friday, Jan. 22 in the Lorne Watson Recital Hall (LWRH). They will perform works by composer-in-residence Gordon Fitzell and BU student composers Mark Marinic and Christopher Byman, among others. Friday’s concert will feature the world premiere of Orpheus 2 by T. Patrick Carrabré. Guest ensemble XIE Improv will also be on hand for both nights. “This annual celebration of newly minted works is an outstanding chance for students, for faculty and for the general community to hear and experience what is unfolding in music today,” said Acting Dean of Music, Greg Gatien. The main concerts begin at 8 p.m., in the LWRH, located in the Queen Elizabeth II Music Building at BU. Both offerings will include pre-concert performances in the School of Music foyer at 7 p.m., followed by post-concert performances in the faculty lounge. The next pro series recital presents pianist Michael Kim with the Fine Arts Quartet, on Sunday, Jan. 24, at 3 p.m., also in the LWRH. Tickets are $15 for adults, $12 for students, seniors and alumni, and $10 for Conservatory students, and are available at the door or in advance in the Main Office in the School of Music. On Monday, May 16, the pro series presents violinist James Ehnes. Tickets for this recital in the Western Manitoba Centennial Auditorium are specially priced at $25 for adults, $20 for students, seniors and alumni, and $15 for Conservatory students. These tickets are not included in the pro series subscriptions and must be purchased through the WMCA box office. The School of Music gratefully acknowledges the generous support of the Canada Council for the Arts, and the Province of Manitoba, through a Consolidated Arts Programming Grant through Culture, Heritage and Tourism. Please note that seating in the Lorne Watson Recital Hall is limited and that programs are subject to change. For up-to-date listing of pro series and student performances, please visit brandonu.ca/music/events/category/performances/.